The 17.12.1 driver breaks the Command & Conquer 3 and Red Alert 3 (and associated expansions). 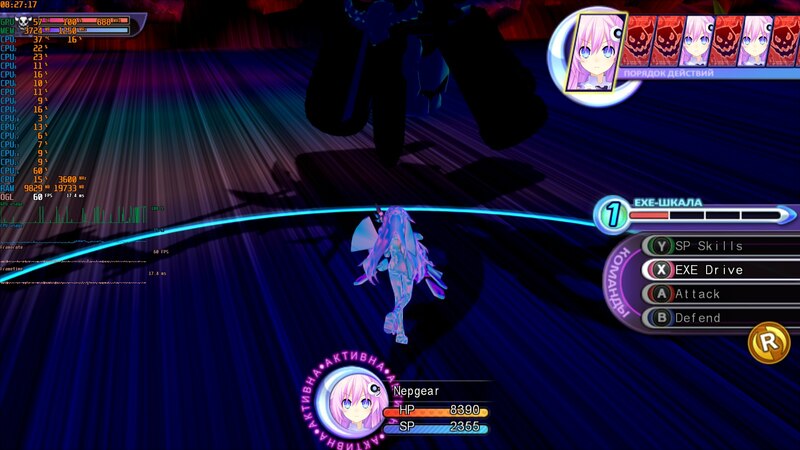 The games crash with the error "exception in exception handler", but after reverting to the previous driver the games work properly. According to Reliability History the faulting module is atiumdag.dll, which further proves it's a driver issue. Anyone encountered similar issues, or maybe people running different GPUs or Windows versions with problems/no problems? Let me test I have both titles installed. I am on a R7 200 series GPU with windows 10 fall edition. Cant even start the game. Very strange indeed. May be some bug in the Docs settings I'm not sure well I hope so. Can confirm the issue with the Origin/Ultimate collection version which is the latest version of the game. Everybody needs to issue a report to the AMD Driver team because they wont see this here. I sent a bug report to AMD please make sure you all do the same. Thanks for all your feedback! Based on the information received for this particular issue, I'm glad to inform you that we are looking to get this issue resolved as soon as possible. I'll let everyone know once a fix is available. Drivers shouldn't break applications anyway especially such as these games that are all using a standard DirectX 9 API. If anything it's just going to encourage people to switch to Nvidia. UPDATE: Thank you for changing your mind about this issue and keeping your costumers (myself included) happy. OLD TEXT: Dear Sir, while we appreciate the response, choosing to break older games for the sake of new mandatory driver features is a big fat middle finger to gamers. It is completely unnaceptable for us gamers to have our games broken just because AMD feels like it. Its nonsensical to ask a game which is almost 10 years old to be updated to work with your drivers. Please fix this issue which is clearly a fault of your drivers and not the game itself. Furthermore i would like to add that youre not talking to a xbox360 player, you are talking to computer enthusiasts which expects a 600€ graphics card to be able to run a petty game from 2009. It's so sad that i even have to say this to you. As long as old games works with nvidia we will get a card from them the next time if you won't fix this. They are even faster than AMD so that's a bonus. So what if they are more expensive if they WORK with the games we play? Is this an equation to hard for AMD to comprehend? Maybe there will come a time when the OS and hardware are no longer compatible with older games. We have to accept that. But that time is NOT here yet. So don't talk to us about "outdated API modules". That's BS. AMD need all the goodwill it can deliver. So pretty please with sugar on top, fix this issue. AMD Team you are the underdogs, I love an underdog, its you that pushes the technology tree, the top of the table just stagnate progression we have seen this all too much. Please just study the atiumdag.dll your debugger should easily solve this hiccup. Have a great holiday AMD Team. First of all the game ran fine before the driver update so its clearly a problem on your end which you can easily fix with a hotfix. Secondly this is not "Big mother truckers" its arguably the best Command and Conquer game ever created if not the RTS game. Thirdly multiple command and conquer games are suffering from this issue. Not to mention this 10 year old title alone has more online players currently on steam only than some new titles (khm. Ashes of the Singularity...) on which you still spend "engineering resources". TW, KW, RA3, Uprising have around 1500 players combined daily on Steam which doesn't include players of the origin or ultimate collection version. We don't ask for performance optimizations for a 10 yr old title, just fix what's been broken by your latest driver branch. Thanks. I hate to be harsh, but it takes "valuable engineering resources" to fix something that has worked on every single Catalyst and Crimson driver, right up through November of 2017? Fixing this is THAT much of a challenge? For an outfit that is struggling to win, or just maintain, the hearts and minds of the PC gaming public, this is a very strange strategy. I had the same problem with C&C 3 Tiberium Wars, C&C 4 Tiberian Twilight and C&C Red Alert 3. Uninstalled useless new driver and reinstalled 17.7.1 and all 3 are now working again. We even created a mod that removes all ''Superweapons'' and modified the Ai to build massive base's which is a completely different way of playing this game its Epic. There's a mod that increases the allocated memory from 2GB to 4GB, makes a big difference. The new update breaks The lord of the rings: Battle for middle earth 2 as well. I think it uses the same engine as C&C. Yes it does. Although C&C Generals is not affected. Yea ray_m, that's right. OUR feedback. You know the feedback you tried to stop by locking threads so we could not diskus it. The same you do with OpenGl. 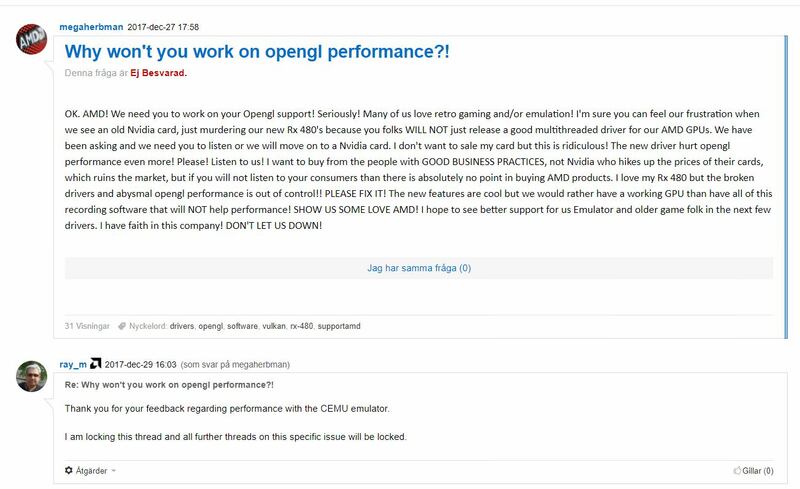 Regarding OpenGL threads, I was wondering why all of them were closed. It would have been nice to have at least one openGL thread open to keep discussions going. I just tested my 11 year old nvidia 9600GT which uses opengl version 3.3 in Citra emulator , and it runs better than my HD7800 series amd card, which uses openGL 4.5. Now that is something to be mentioned I think. What in the world is wrong with the amd driver, that an 11 year old nvidia card runs the emulator better. I always thought the OpenGL issue was a windows 10 problem, i was wrong. Unreal Tournament 99 has alot of graphical glitches are speed issues when openlGL is enabled. I think we should give Ray_M a break. It was the holidays, and for all we know Ray could have been dealing with the aftermath of twelve gallons of Jim Beam or Chivas Regal (for the twelve days of Christmas), accentuated by twelve very long and aromatic cigars....;) I sympathize with him--a quick review of the forum reveals he is constantly bombarded with dumb questions by people too lazy to read up on their "issues" (which often result from simply not following written directions) but not too lazy to forgo coming out here and asking questions that cannot be answered by anyone because the customer is too lazy to leave his hardware and software environment details. Questions just like: "Help! Black screen and nothing else. What do I do?" Such ludicrous question are unanswerable. But Ray_M sees dozens of such posts daily. It's got to wear on any sane person's patience quotient--as in exhausting it from time to time. I knew for instance when Ray said it was *probably* not going to be worth the trouble to investigate and correct that Ray had simply put his foot in his mouth. It happens. These issues were caused by a simple driver bug that I knew AMD was going to fix, even if Ray_M had a hangover as big as Jupiter and his tongue temporarily got in the way of his brain. It happens to *everyone* occasionally. Instead of the raw panic I saw, and people behaving irrationally over a single statement made in the forum over the holidays when everyone else in the tech companies was likely twelve feet under and nursing their own apocalyptic Christmas-New Year hangovers--all it would have taken is a little common sense to understand that AMD makes 3d accelerators to enable its customers to have a superior experience and *no way* was the company simply going to set back and say, "Aw, let 'em eat dirt, the bums--who cares about those silly games, eh?" I don't believe AMD has ever said that or done that, actually--in its history of manufacturing 3d-accelerators. So why should they start now? They shouldn't and wouldn't--of course. The Internet can be a wonderful source of information that is valuable and timely--but it can also lead to mindless panic and become a recycling station for information that is wrong--and not just wrong--it is often just stupid and sometimes idiotic. Not only was the Internet utterly wrong about this--the vitriol spewed about AMD by clueless people over this one sentence by Ray_M--that didn't even say what the people doing the hating on AMD said that it said...;) Ah, it was all just too nutty! Predictably AMD named it a driver bug and is fixing it even now and has already released an alpha driver that anyone playing that short list of games can use to play them--that is, if they simply cannot wait on the next official, non-alpha driver release from AMD that will do an even better job of fixing it. For instance, discussing ignorance running wild on the 'net, how many people actually realize that "Spectre" and "Meltdown" are not names for viruses or malware or worms that are actually in circulation and being passed around and harming people's systems? Someone with exceedingly poor judgment--probably Google, I'm guessing (because Google was involved in the hacking that "discovered" the vulnerabilities----came up with the bright [not] idea of calling these proof-of-concept vulnerabilities by these terrifying names. Names like this are generally never assigned to mere vulnerabilities for which *no exploit software exists anywhere in the public domain*...they are reserved for worms and/or malware that is actually in circulation and actually "infecting" people! But in this case, someone obviously wanted to panic the public and ignite the ignorance factor--I've already seen posts on the Internet in which people are asking, "Will my computer actually melt if I get Meltdown?" and "Can Spectre read all of my encrypted data?" Answer to both questions is "no." You cannot be "infected" with either Spectre or Meltdown because such named malware of any description does not exist on planet Earth at this time--but the people who pushed these ridiculous names on the Internet have been very dishonest about the whole thing, imo. Shady and sneaky--like Apple--seeking to exploit the ignorance of many people who try to use computer tech today. I tried 17.12.2 and it indeed is bugged and would not open any of these games on Windows 10x64, version 1709, build 17074. The alpha driver runs every one of them. I have re-installed 17.12.2 because I am not actually playing these games atm and am content to wait on the official fix in the next driver release. Looking forward to testing the fixed driver since the current drivers don't work on either of my 2 gaming PC's, both AMD. Based on the feedback we provided? Or because several online news outlets reported about the issue. You said we are not going to waste resources on a 10 year old game and thread closed. But now everything is getting addressed. Thanks for all your help mate! Hey Ray just a thought. Since new people looking for help may be having issues with any of the other DX9 titles having issues and not be aware of or even have C&C games can we stop just locking threads and directing them here? Maybe go back to some of those threads and add a link to a pinned response with all info and a list of known affected games? I am sure many looking for help may not find it in all this mess. Just seems silly to point such a wide problem to a post concerning one game when you could spread good info so easily with a pinned post. Just my 2 cents and I am very glad Terry is on the case! atiumdag!XdxInitXopAdapterServices+0x24b416: 682ac9a6 8b448808 mov eax,dword ptr [eax+ecx*4+8] ds:002b:00000308=???????? Some of my thoughts on this matter would be that, firstly, I'm glad people took the time to speak out about this. I am either blessed or cursed, (depending on one's perspective), to have several PCs at home. So, when C&C 3 went sideways with the Adrenalin drivers, I had a readily available back-up platform to use. Not everyone has this "spare tire." My first inclination was to just let it go, so, my thanks to everyone who took the time to bring the problem to light, and stay focused on wanting a solution. Secondly, it would seem that whatever Quality Assurance program RTG is using to qualify drivers needs some scrutiny. They're under a lot of pressure to make sure that games on the bleeding edge are 100% on launch. But, games perceived to be on the trailing edge by some, shouldn't break if they were working just fine on drivers released just a few weeks earlier. I've read, but haven't personally confirmed, that the x86 DX9-version of Skyrim was broken for some using Adrenalin. If this is true, RTG is literally risking torches and pitchforks at the doors of their headquarters. Finally, I really can accept that when programmers are juggling who-knows-how-many lines of code intended for use with a mountain of different applications, it isn't surprising that something might get clobbered in the process. Stuff happens. It's what happens *afterwards* that matters most. It appears that RTG is confirming this problem is real, that it isn't acceptable, and that they are working on a solution. Speaking only for myself, I'm satisfied with that response. Time will, of course, tell. Tiberium Wars, Red Alert 3, Witcher 1 tested by me, they're working now. check my posting of work arounds it may help some others it may not tho if you follow you should have an issue. I been running dx9 titles & been testing heaps in the last few days no issues. A lot has come from bugged updates between steam/ OS/ auto driver updates. If you you use CC cleaner or registry cleaning software this is really important & maybe easy fix. I havnt been using AMD for long but had no issues software wise with the new Adrenaline drivers. A tip is de install all graphics drivers download a fresh set oif drivers with the Andrenaline software important. First clean all registrys off error ridden files weather you use CC cleaner or what ever registry cleaning software you use wipe you registry clean for the best way to find the bug. Install the drivers manually turn auto updates for the drivers off. Run the software close it, then run a registry clean over a few times till no registry errors show. Go threw if games installed on steam & verify all integrity of games saved being on dx9 titles, I wont guarantee this but it works depending how well you know your software i have a full walk through & there many being uploaded to U Tube of work arounds atm. Just 1 idea thats worked not in all cases it helps tho heard no word from AMD but having a dig wise in driver files & game files may alleviate some faults to. New to the AMD software & AMD brand but have previous has issues with nvidia in the past where i learnt a few tricks which are basically simular work around with Windows 10 as well. Hope something i suggest helps any ideas are great but a couple basic tips that may get them working but its been case by case no every1 experiencing the same issues. Tho i walked threw a m8 installing a new rx card the same way i done it & all dx9 titles are working. Tho another with auto updates turned on dx9 tiles arnt, its somewhere between the auto update on the Andrenline software or updates wise that been turn on as auto. Just throwing some ideas that may help or work & some which probly been done i hope my technical know how helps someone. Its funny doing the AMD technical support when i am new a lot come from the basics over looked why the drivers have been hit or miss, common sense easy things that should be done regulary to keep a computer going smoothly sometimes is the most over looked which can cause the issues from years of experience working with windows 8.1Pro & 10Pro since first released even the insider program. Give it a shot tho trying to help not AMD fault things do happen & Nvidia drivers are as bad atm tho they been locking there threads atm to hide whats going on & a lot more threads thats been reported have been locked or wiped so its not just AMD having issues. Got a m8 who tests for both brands & from what i have seen I wouldn't trust Nvidia ever again but they have more $ than a bull can crap & pull the wool over peoples eyes to hide the truth. I trust AMD be working on a fix right now as usually prety good they know about it, from what i heard tho its a bug thats unforeseen not official tho a tester m8 beta driver testing are atm digging threw the code trying to find the exact fault is as the beta drivers before release games were running dx9 i have seen a few play throughs to verify it. Main ressources ingame (tiberium) still has the issue. Tiberium is pink with my rx 480. Basically, now the game starts but there are graphic problems. It looks like is fixed in Beta 18.1.1 Driver o.k. The Witcher Enhanced Edition is running fine for me now. It would not even launch with Adrenalin 17.12.1 or 17.12.2. Driver 18.1.1 fix start DX9 games, but don't fix discoloration in DX9 games. - 2016 and before : works pretty good, but flickering screen on some games : special amd patches needed for many games. - Déc 2016 : almost no more flickering, but discloration with many directx9 games. - Déc 2017 : broken directx9, Many games can be lauch, but they are broken anyway (bugs & crashes). - Jan 2018 : directx9 is "fixed". But discoloration is returned ; with slightly diffrent effects than before. ... and actually, we don't know how many games are still affected in addition to the "main ones". Please AMD devs, release stable driver for directx9, finally. New optimizations should absolutely not break older functionnality. This is how the world of PCs works. This reply is really to anyone having this discoloration issue. I absolutely believe it is happening however not completely sure what exactly we are talking about here. Like a strange overall shift in screen color? Or say a screen having a blue or other screen tint to it? Or say just individual textures having a severe tinge of odd color to them. If someone could post a good and bad picture comparison to link to it may help direct someone better to the problem. While I don't know that any of my DX9 games are doing this, I also don't know that they are not. But I have had some seldom, but frequent enough issues under DX11 in Battlefield 1 specifically. Two different odd things happen one the whole screen will sometimes go into a Dark Blue heavy overall screen. The other is that textures like when I am riding the horse just me and the horse are red colored. I did not have this before the latest driver. But it's random that it happens and restarting the game definitely fixes it. Just really curious if your issue is similar and maybe not just isolated to DX9. The issue is the discolouration with the Tiberium in Command & Conquer 3. Someone has posted a picture a few posts above. It has a pink effect around it which shouldn’t be there. Any response to this AMD team? With all due respect you haven't fixed this issue you only have a workaround. Also you cant pull out the ''Game is too old'' card anymore as AMD stated regarding this issue. Don't you think it would be a good idea to actually respond here? Please, respond and/or fix it. Hi, I'm also having problems starting C&C kanes wrath. Tryied to delete current amd sofware and installed that 18.1.1 version. Still doesnt work. I have installed 18.3.3 version now and still no help. When is this going to get fixed so it works properly? This should be solved via the new drivers. The remaining issues in C&C 3 + add-on are 1) the wrong color for Tiberium, & 2) an overall excessive brightness. A kind of excessive brilliance on the battlefield. The second is more embarrasing I think. Because of that, units are sometimes difficult to see. I think you should try reinstalling directx 9c, because some directx9 files may have been broken by older broken drivers. And that's what I did successfully. Tiberium color fixed, finally ! Excessive brightness is still there, but that's mitigable with meticulous settings adjustments. Did they fix the color issue in 18.5.x or 18.6.1 ? Hi Szaby59, I can confirm the latest drivers finally fix the colour issue. I updated and played at the weekend and now see the lovely green glow of Tiberium again the way it should be without pink. Re: [17.12.1] The Witcher: Enhanced Edition does not start!